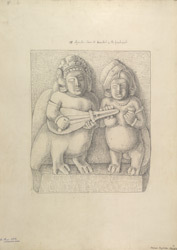 Illustration of a bracket from the front aisle of Cave XVI at Ajanta, from James Burgess' 'Original Drawings from the Buddhist Rock Temples at Ajanta.' Cave XVI is one of the finest Buddhist caves at Ajanta dating to the 5th Century AD. This view shows the front aisle of the chaitya hall. Plain octagonal columns stand below a ceiling carved to imitate wooden beams, with ends supported by ganas, musicians and flying couples. The shrine contains an image of teaching Buddha seated on a lion throne. Some of the wall paintings inside the hall still survive.